What is this, you ask? A sketch, or drawing of sorts? Why yes, yes it is. 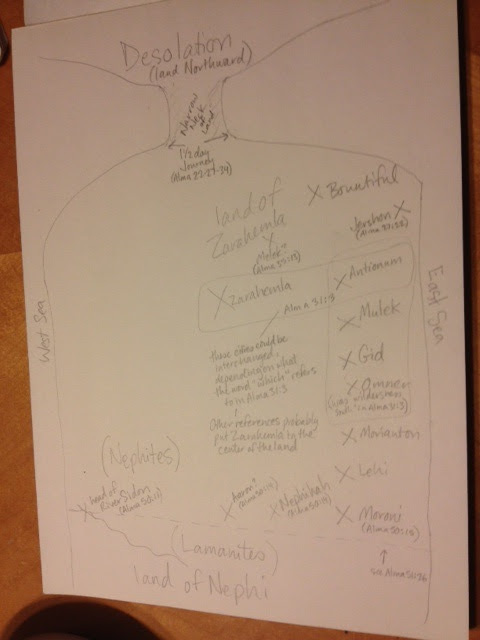 I'm a nerd for Book of Mormon geography, and this is my map of where it all went down. While I won't say that it did or didn't happen in one region or another, I will say that this is my interpretation or layout of how it's described during the period from Alma-Helaman. I appreciate having a layout, so I can envision the movements of all the armies. Having it set out like this allows me to ponder some questions. Like in Alma 51, it says that the city of Nephihah was so strongly fortified that Amalickiah refused to go against it. Instead, he headed for the city of Moroni (bottom right), and then continued on to take Lehi, Morianton, Omner, and Mulek. (It doesn't mention here anything about Jershon or Antionum.) They were headed toward Bountiful, when they were repulsed by Teancum and his men, who were "great warriors". I gather that Teancum and his men were likely the best of the Nephite forces; their elite. So why were they kept up in the north-east corner, when the Lamanites would've likely come up from their lands, in the south (the land of Nephi)? Having a good sense of the layout of the land helps bring up questions like these. Good things worth pondering. One can say that the geography got all messed up when Jesus was crucified. Cities were sunken, burned, raised up and down... so it might all be entirely different from what it was. But I really enjoy having something to imagine with. Hopefully someday soon it'll all be revealed. What a fun day for all that will be! ha! True. Now if I were clairvoyant I could draw the seashores a little bit better... :) I sure wish we knew where it was, exactly. That would really be more fun. Shifting at "A Major Shift"